Just like Walt Disney World, Disneyland has their version of Innoventions. Innoventions, located in Tomorrowland at the Disneyland park, hosts Iron Man Tech Presented by Stark Industries, Captain America meet and greet, Thor meet and great, Project Tomorrow, The Innoventions Dream Home and ASIMO. Iron Man Tech is an awesome exhibit and it shows by the number of people who line up to virtual try on suits and those that are taking photos of and with the various versions of the suits in Tony Stark’s Hall of Armor. As you can see from the photo, the suits are movie screen quality. I am not a stickler for details so I am not sure if they are screen accurate, but if not I am still impressed with their build and quality. 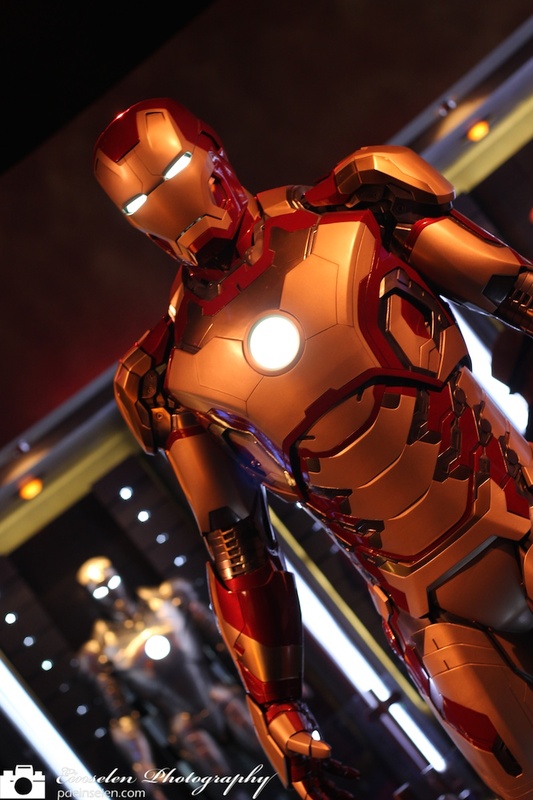 Tony Stark’s Hall of Armor features Iron Man suits Mark I-VII, the same suits can be seen in the film Iron Man III. Also as stated earlier, guests are able to virtually try on the Mark 42 and test out the capabilities. This is all done using augmented reality and a joy for people of all ages.